Well, it's the beginning of 2009 and I haven't posted any recent work, so let me get to blogging! Last year I was fortunate to have some brides that I just clicked with and felt a natural closeness which could mirror a friendship sense whenever we would communicate either via email, person or telephone. Well, those weddings have come and gone :( and since I had been afraid of not having another bride that I felt the same connection with... Well, I am blessed because Eva is that bride for 2009. 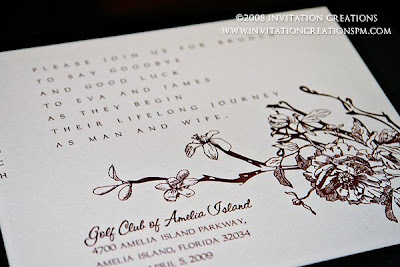 She found me sometime around July 2008 and gave me plenty of time to create her unique invitations for her April wedding. Though I can work with less time, I think this way is better for both parties. Eva likes the classic suites with touches on modern flair which in my opinion is a reflection of her spirit as well. She is a beautiful girl inside and out and I know she is going to be absolutely stunning on her wedding day. 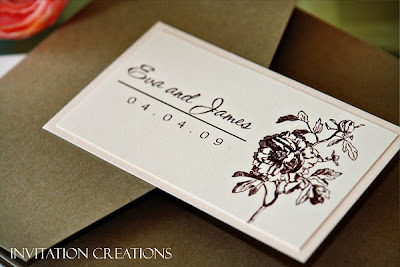 She expressed to me at our initial meeting that she wanted a floral graphic incorporated in the design. 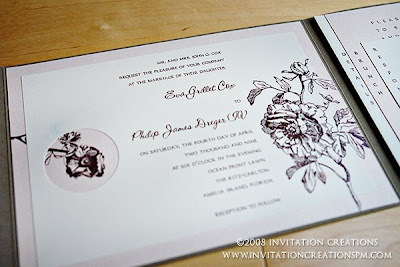 She had pointed out that she liked the floral graphic I used in Dierdre's invitation though she really liked the Hunstein suite. The Hunstein suite had more of an Asian flair using cherry blossoms, but she liked the concept. So, off I went to stir my creative juices. I created several samples, all pretty unique with different floral graphics. Of course, one sample was the graphic she liked from Deirdre's invitation and incorporated it in the Hunstein suite layout with her colors. Another detail that I did for the Hunstein suite was complete the postcard on both sides and Eva liked that idea. So I made sure I did that on all of her samples. So which one did she choose? Of course, the combine Dierdre's and Hunstein invite which is now what I like to call the Dreger Suite. It's a personal favorite of mine. 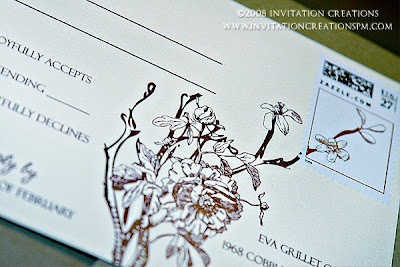 Another detail that I really enjoyed doing for Eva was create her custom stamps for her postcard response card and her outer envelope. I have suggested this many times and many times get rejected for the mere fact that there is a premium cost(not mine) on the custom stamps. 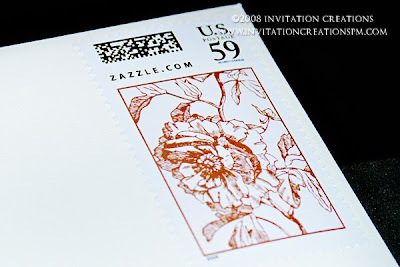 Yes, it's definitely a cool factor, but I think it really completes the invitation suite and if you're going to spend good money on the invitation, I think its worth the investment in the personalized stamps to complete the look. Looking at Eva's suite, just confirms this personal opinion. Of course, I'll let you be the judge :) There were many aspects of the Dreger suite that I loved but I have to say my favorite was the postcard. 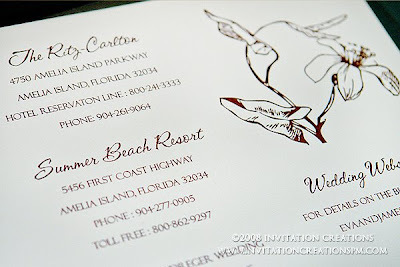 First of all, it was printed on both sides giving it a complete look and the custom stamp was designed to be a seamless part of the graphic printed on the postcard itself. Ahhh, I just love it! 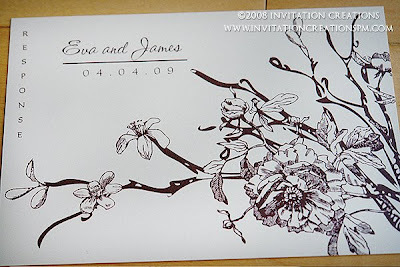 Initially, Eva was going to have hand calligraphy done for her invites, but in the end she decided on the machine calligraphy which has the option of incorporating the same fonts as the invitations which is what we did.